Okay, these fossils are quite small and are in need of magnified shots. 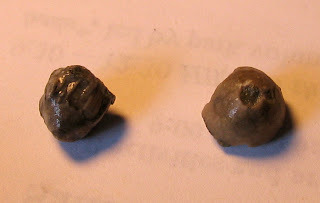 Two crinoid calyxes found in the Waldron Shale of Clark County, Indiana. They are less than a 1 cm wide. What is special about the calyx on the left is some of its arms are intact which is a first for me to find. The calyx on the right is a Eucalyptocrinites.